After R.E.M. amicably disbanded in 2011, bassist, composer and all-around utility man Mike Mills started looking for new projects to tackle. He considered doing nothing – “I can goof off with the best of ‘em” – but ultimately opted to pick up a gauntlet laid down by his friend from childhood, acclaimed classical violinist Robert McDuffie. 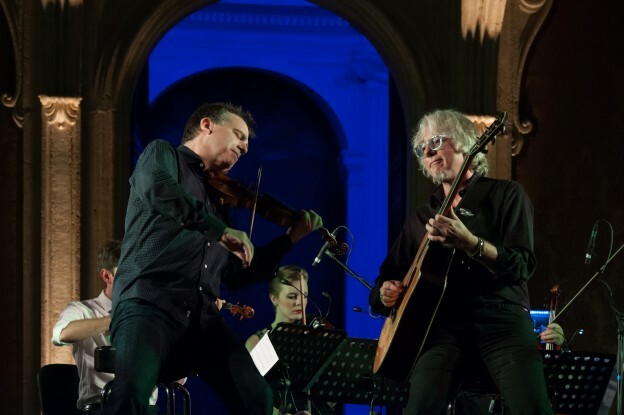 Five years later, McDuffie and Mills are touring the country, performing Mills’ “Concerto For Violin, Rock Band and String Orchestra.” The piece, which had its world premiere in Toronto in June, also features the 11-member chamber group Fifth House Ensemble. Mills, who wrote the music for many of R.E.M.’s most popular songs, will play bass, piano and guitar during the performance. He’ll also conduct the onstage rock band, which includes two additional guitarists and a drummer. Although he reads music at a rudimentary level – thanks to his Macon, Georgia high school marching band and jazz combo training – Mills isn’t a composer in the classical sense. He came up with the melodies for all six of the movements in his concerto, and devised every nuance of McDuffie’s solos, then collaborated with arranger David Malamud on the actual scoring. Indeed, the music is deeply dramatic, with numerous lighter, poetic flourishes highlighting, say, a simple string quartet or McDuffie’s soaring solo violin. And many of the melodic motifs are haunting and darkly melancholy, like a fistful of great R.E.M. songs (indeed, the fifth movement uses “Nightswimming,” an R.E.M. hit for which Mills wrote the music, as its central theme). Although each of the six movements has a name, the 45-minute whole is just “Concerto For Violin, Rock Band and String Orchestra.” Mills acknowledges that it’s “a very bland descriptor,” but insists that’s simply how it’s done in Classical World. If all that sounds just a trifle pretentious, or far too clever for rock ‘n’ roll, Mills wants you to know he and McDuffie have taken on this project for a very, very specific reason. “One thing we’re trying to do is show people that the walls between these genres of music are not quite as high as they think they are,” he explains. “It’s rock ‘n’ roll music, but it’s played by a classical violin and a string section.